Cruising is not the goal in the Gulf of Suez, one transits. There doesn't seem to be many protected anchorages and those that do exist don't seem to be very attractive stops. The idea was simply to get to the bottom. On the other hand it cannot be done in one day and night passages aren't really attractive either. The gulf is crowded with oil rigs and the pilot books talk about well heads that are cut off at or just beneath the surface. So three stops were planned that would allow day sails and provide reasonable protection. The second stop was Marsa Thelemet, which is a small bay formed entirely by a coral reef that is just inches below the surface. The entrance could be a little tricky if you weren't paying attention, but it was well marked and we entered while the sun was still high, 13:00, so we could see the reef clearly. I don't think I would have liked to enter after about 14:00 because the sun reflects off the water and you can not see the reef. Once inside it opens into a rather large, well protected pool with good holding. The wind was blowing in excess of 30 knots the day after we arrived, but we were protected from the sea and the anchor held firm against the wind. We rode out the blow and didn't leave until the following day. 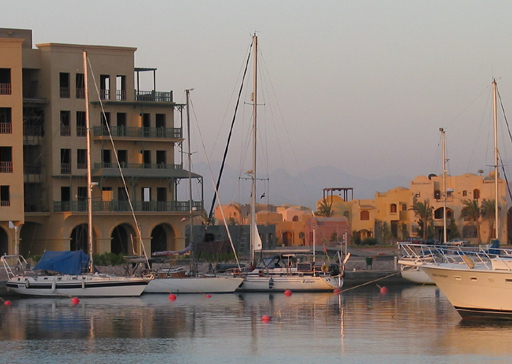 The Abu Tig Marina is located at the bottom of the Gulf of Suez or actually at the top of the Red Sea and within the El Gouna resort complex. 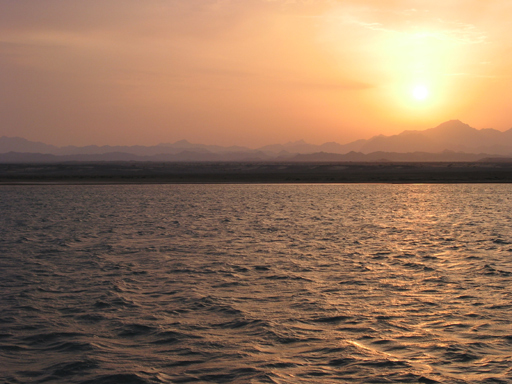 El Gouna is advertised as "the Red Sea Riviera where the sun shines all day every day" and it does. It boasts 14 hotels including three 5-star resorts with all manner of entertainment facilities. Walt took advantage of the great scuba diving opportunities on the nearby reefs and we used this stop to tour the fantastic ruins of Egypt's ancient past along the Nile River. 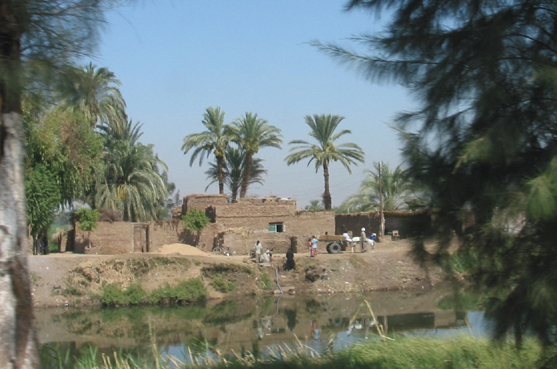 The overland trip to Luxor was in a van with driver. 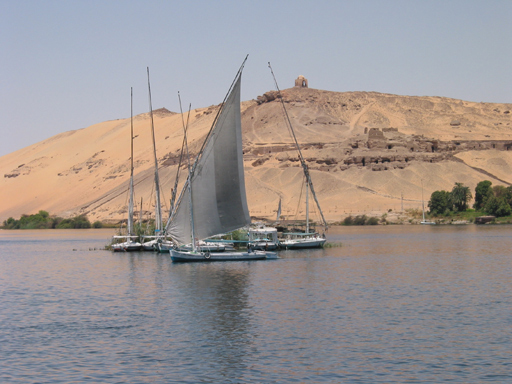 Then a river cruise up the Nile to Aswan and a car and driver from Aswan to Abu Simbel. On the return trip we took the train from Aswan to Luxor. The driving trips were all done in convoy with armed escorts, part of the counter-terrorism measures adopted by Egypt after the tourist massacre at Luxor in 1997. 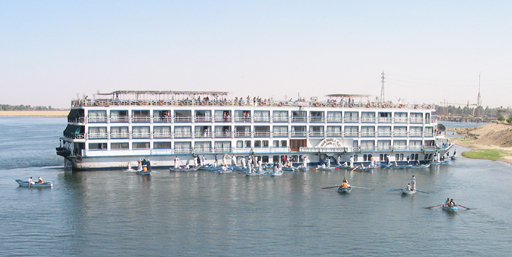 In Luxor we boarded the Nile Admiral, our floating hotel, before touring the Luxor Temple, Karnak, the valley of the Kings and the Temple of Hatshepsut to name a few of the high lights. 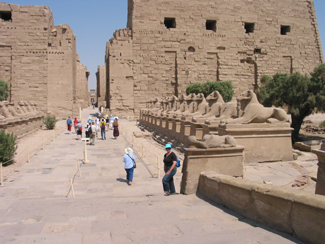 The main purpose of the tour was to visit some of the most famous achievements of one of the worlds oldest civilizations and to ponder the legacy they have passed to mankind in general and to Egyptians in particular. However, whole libraries of books have been written on these subjects and whole galleries of beautiful photos are available for anyone interested. Therefore we shall move on to other scenes. On board there was, of course, the obligatory "Arab night at the disco" which we dutifully attended and thoroughly enjoyed. The bucolic and seemingly timeless scenes along the banks of the Nile River stand in stark contrast with the smog laden and traffic chocked streets of Cairo or the opulence of the Red Sea Resorts. 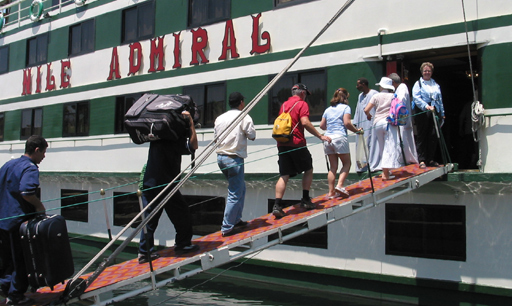 Every stop along the river offered the opportunity for local entrepreneurs to talk the tourist out of some of their money and they made the most of each opportunity. 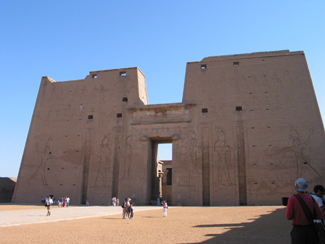 As you can see here in Kom Ombo. Even when the local salesmen could not talk to the tourist they found ways of offering their wears. While waiting for their turn in the lock, the river cruise ships nose into the bank. Locals bring boat loads of merchandise out to sell. While observing the scene from the top deck of our craft, a bag containing a lady's dress landed on the deck at Jane's feet, thrown there by one of the boats below. If you like the item you can throw down the money, if not throw the garment back. 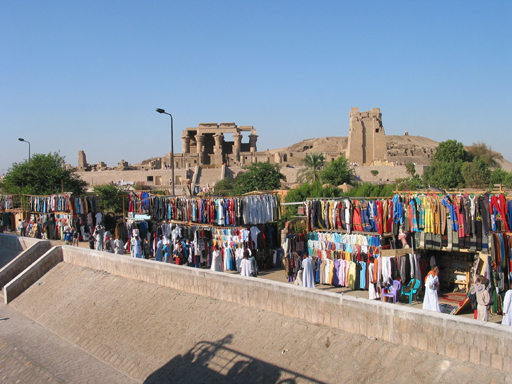 It is easy to become offended by the aggressive sales tactics used by these merchants, but tourism is a major part of the total economy and for these people located away from Suez Canal, another big component of the economy, it is probably the single most important source of income. We found it best to accept it as part of the experience. 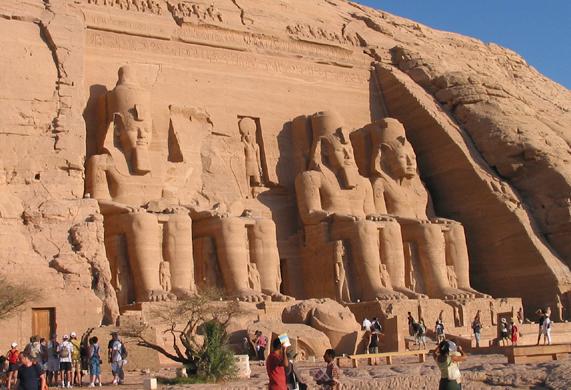 Abu Simbel must rank among the most amazing artifacts of ancient Egypt. Originally carved out of a mountain on the west bank of the Nile, it was about to be inundated by the rising waters of lake Nasar, building behind the Aswan Dam. Archaeologists literally dug it out of its original mountain and replanted it in another higher up. This facade is 98 feet tall and 115 feet wide and a temple extends 100s of feet into the mountain behind it. An amazing feat. 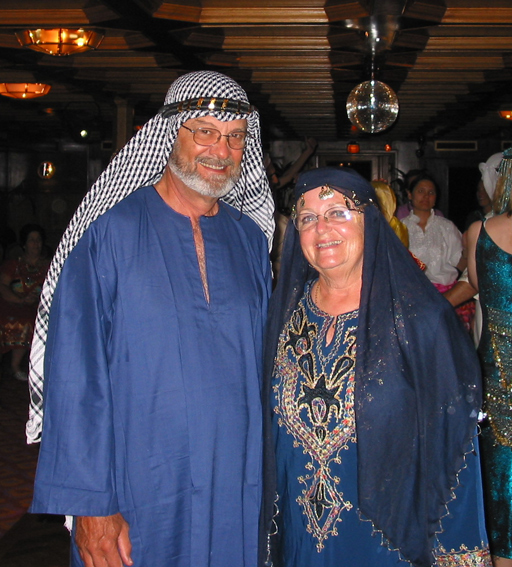 The return to Aswan coincided with our 20th wedding anniversary. To mark the occasion we had decided to stay at the famous Old Cataract Hotel, have a nice dinner and a good bottle of wine. This hotel was the setting for Agatha Christie's "Murder on the Nile" and it still maintains the high standards of service that it did in its colonial past. To our surprise the hotel management had been informed of our special occasion by the travel agent and upgraded us to a large suite that provided this view of the first Nile cataract and Elephantine island. Had we known we would have stayed a week. It was lovely. 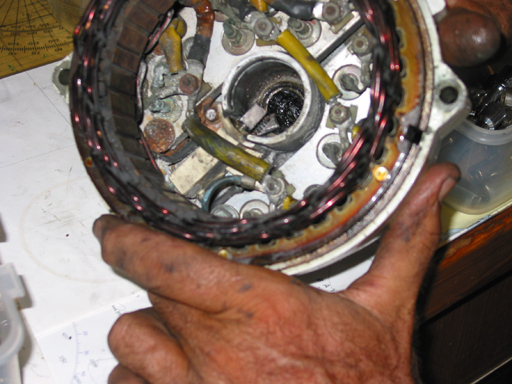 Shortly after returning to Abu Tig the alternator on the gen-set stopped producing electricity. While not vital, its loss was a major inconvenience. Without it all battery charging would have to be done with the main engine and worse the water maker doesn't work. Many people have made this trip without a gen-set or a water maker and we could also, but would rather not. The parts, diodes in this case, were on board and the repairs could be done but gaining access is a major undertaking, still we managed. This unit would fail again during this trip, but not until we arrived in the Maldives, on that occasion it was the bearing. After a stop to clear customs in Hurgada just 17 miles south of Abu Tig, we visited Marsas Toronbi, Umbeila and Hamsiat, before arriving in Suakin, Sudan. 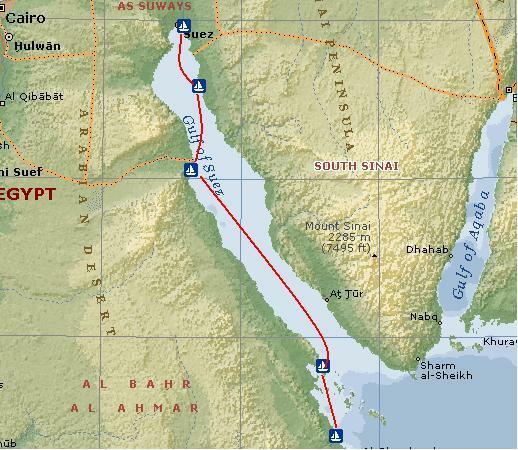 More stops in Egypt were planned but the weather caused an alteration of those plans. By midafternoon after leaving Toronbi the winds had died away, sails were furled and the motor was running, but about 03:00 the following morning the winds started up out of the north, by 05:00 it was a strong breeze about 25 knots, by 06:00 it was a full gale, over 40 knots. The peninsula midway between Toronbi and Umbiela, the planned anchorage, offered no protection. The next possible anchorage was Umbiela. 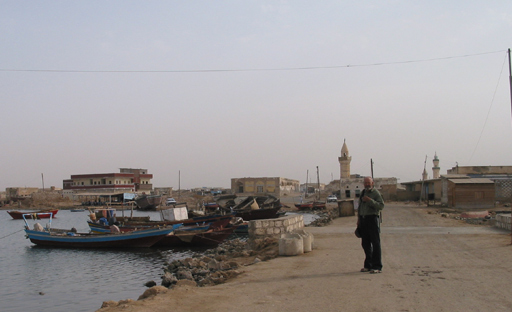 Marsa is Arabic for an open anchorage or bay as opposed to an enclosed bay. In the Red Sea they are surrounded by coral reefs. This was the case at Marsa Umbeila. The wind was still blowing 30 knots when we entered the marsa. That coupled with the nearness of coral reefs just below the surface heightened the normal anxiety of entering a narrow unmarked bay for the first time. Fortunately, the anchor held on the first try as the reef astern was only a boat length away when we settled in. The shore line around Umbeila showed very little sign of life, there were a few camels and some goats on occasion, but little else. We were completely alone. Even though there was nothing but desert scrub and thorn bushes ashore the place had a starkly beautiful peacefulness that was captivating. We waited here three days for the winds to calm down then moved on to Marsa Hamsiat a trip of only 22 miles. In Marsa Hamsiat the winds calmed down enough to snorkel on the reef. When there is a chop running snorkeling is more of a chore than fun. 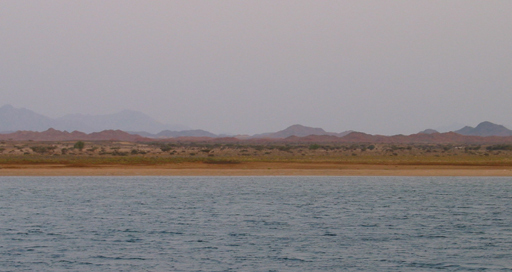 The reef around Hamsiat was only a few feet below the surface and was teeming with all manner of tropical fish, coral and other fauna for which the Red Sea is rightly famous. The winds would usually come up off the desert in midafternoon, the sands they carried produced some spectacular lighting effects. The old city of Suakin was once the major port on the west coast of the Red Sea, today it looks like the backdrop for a futuristic doomsday movie. It has the appearance of 1000 year old ruins, but in fact it was only abandoned in the 1920's when Port Sudan opened to the north and became the main sea port of the country. The buildings were apparently constructed using coral blocks and require constant maintenance. It has been abandoned for less than 100 years and while not crumbled to dust, it has certainly crumbled. 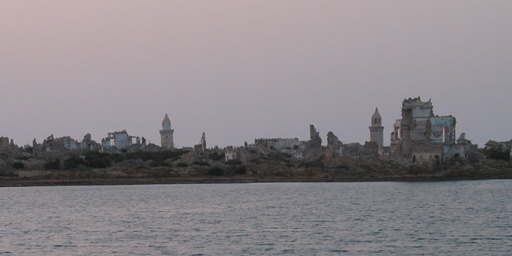 The old city of Suakin is actually on an island that is connected to the mainland by a causeway. On the mainland side of the causeway is a small market with limited goods on offer. This family group was taking advantage of the shade in the middle of the afternoon when we came across them on our way to explore Suakin. 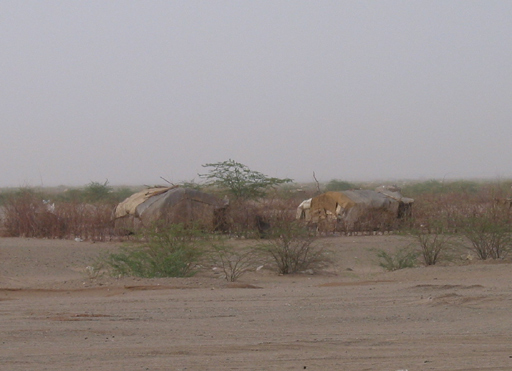 On the outskirts of Suakin you see many dwellings among the desert scrub like those at the right, constructed of branches and any material that can deflect the sun. Any water used by these families is carried on foot from great distances. These people are probably refugees from Darfur or other conflict zones, but that is an opinion which could not be confirmed. Suakin was an interesting stop, but the struggle for survival by the people here is desperate and sad to see. Mohammed, the agent hired to deal with our official check-in and check-out is an educated man. He studied wildlife management, something sorely needed in Sudan, but the area that needs this expertise is in Darfur not a place for a wildlife management expert to work. He took us to a museum that explores the history of the area. On the way to the museum he ran out of gas. He walked back a couple of miles and returned with a liter of gas in a plastic water bottle. We assumed this liter was to get the car back to the gas station, but no, he could only afford to buy gas one liter at a time. 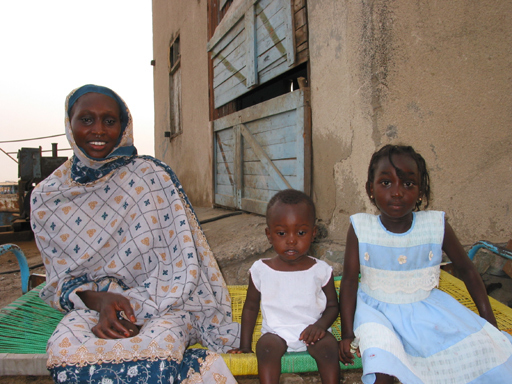 After Suakin we made our way to Massawa, Eritrea and stayed for several days. 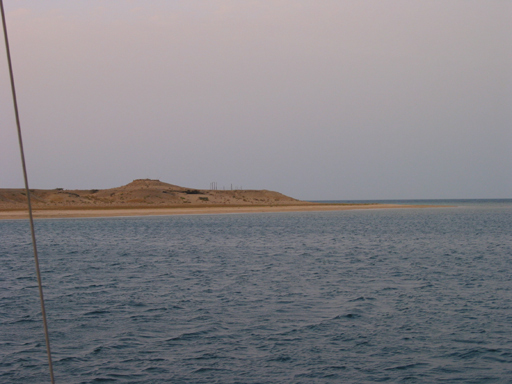 Activities there were limited by the heat and by the fact that Callisto was a lone cruising boat among a host of Yemeni fishing vessels anchored in the harbor. Each of the 20 or so fishing vessels contained from 4 to as many a 20 young men living in open boats. Under the circumstances, we just did not feel safe leaving Callisto for any length of time. From Massawa we made our way to Assab in three uneventful hops. 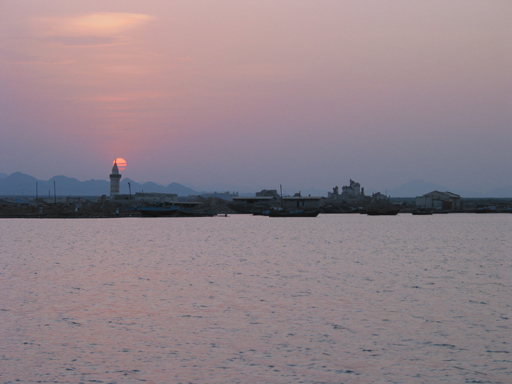 Assab is the southern most port in Eritera and would be the jumping off point for the transit of the Gulf of Aden. We are glad we got to see what we did of Eritera the people we met were all nice, but the years of conflict have left this country a sad place. 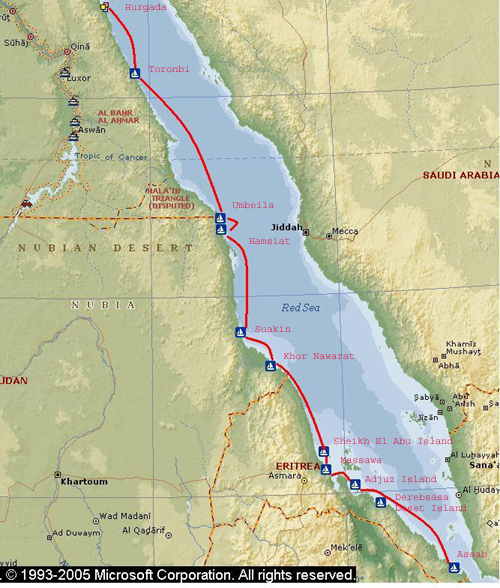 Assab, Eritrea to Salalah, Oman was a 7 day, 773 NM trip. There was very little wind so we motor-sailed most of the way. Salalah to Uleguma, Maldives, was a 12 day, 1302 NM trip. We had strong winds and heavy seas for the first three days. 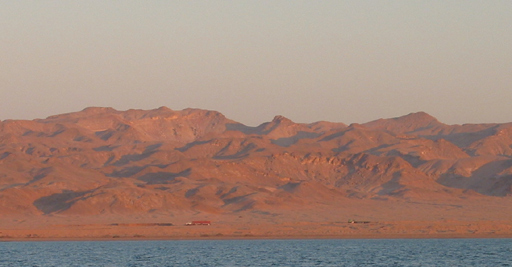 The last 5 days of the trip was almost constant rain (it did wash the Red Sea sand off th boat). The trip to Male, was only 199 NM. We stayed there for two months. Then in early December we headed to Galle, Sri Lanka a 6 day, 551 NM passage. It was an up hill trip all the way with the current against us all the way and strong winds on the nose for the last 3 days. Life on board during long passages is routine, it varies with the weather, but always revolves around the basics: prepare meals, eat, dishes, lookout for shipping, adjust sails, navigate. Walt enjoys passage making, Jane tolerates it.